Suddenly, the solitude is broken with a ground-shaking thud. A stream of sparks blasts high into the sky. There is a brief pause; then, BOOM! A glorious explosion of silver and gold illuminates the sky and the ground below revealing a crowd of over a hundred people. The reverberation of the blast fades off into the nearby tree line and is replaced by oohs and ahhs. For a brief moment, Chris Garland's face is visible, his smile revealing his pleasure in the last shot. He does not linger long, however. There are more fuses to light. "I was into the things most kids were into," says Chris as he looks back on his passion for fireworks displays. "I built models, things like that. Then I found out there was other stuff out there—life firecrackers!" Chris experimented with what was available at the time, putting on shows for friends and family. "The older I got, the bigger it got!" As an adult, his passion didn't wane. "Some of my family would throw a big Fourth of July party. We'd get together, barbecue, and shoot fireworks at night. Both the gathering and the fireworks escalated as time went by. 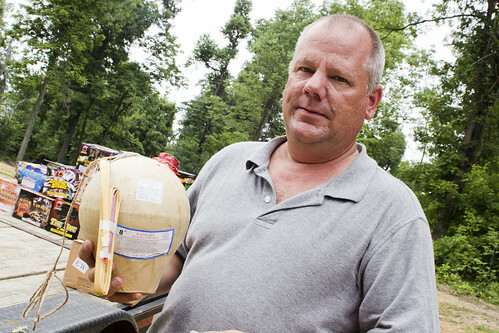 We'd heard about a fireworks importer in central Kentucky, so I called to see if he'd sell to me. I asked about doing the bigger stuff. He eventually convinced me to get my class B explosives license." The license allowed Chris to use fireworks for professional displays. In other words, he could get the big stuff! He soon convinced co-worker and friend Marty Mathis to get his license. The explosive duo became well-known in south McCracken and Graves Counties. "We would do shows for a few churches around Graves," adds Chris. "And when people in the vicinity hear the booms and see the sky lighting up, they come out to see the show!" His mainstay, however, is still the show he does with family and friends each year just before the Fourth. "It is a lot of fun. It is a good gathering. We used to have maybe 60 or 70 people there. Now, maybe a couple of hundred show up!" A team spends the morning and afternoon barbecuing ribs and chicken, carefully applying sauces and rubs as the meat slowly rotates over open flames in a large smoker. Guests arrive, side dishes and desserts in hand. By early evening, several musicians are set up, playing tunes to the crowd now lined up at the long buffet inside the barn. Children splash in the nearby pool as revelers feast at tables adorned with checkered tablecloths and patriotic decor. Chris, his son William, and several other assistants are a safe distance away, preparing for the main event. The ground is cleared, all the preparations have been made, and the wicks are ready. Now, it is time to wait for nightfall. "It takes about four to five hours to set up," says Chris. "It is definitely a job for 25 minutes of fun. But it is worth it!" He watches the night sky and waits for that perfect moment. The first fuse is lit. The smell of burning black powder permeates the air. Then, Chris is in his element. "There's just something to it," he says with a smile. "It is hard to explain." But Chris really doesn't have to. The results are evident. All eyes are glued to the sky for the duration of the show. Then, after the grand finale, an uproar of applause. This is Chris Garland's moment. He is the maestro of explosions.